The GEC Education Mega Centre project reached a milestone on Oct 2, receiving 1st and 2nd readings before Surrey Council. 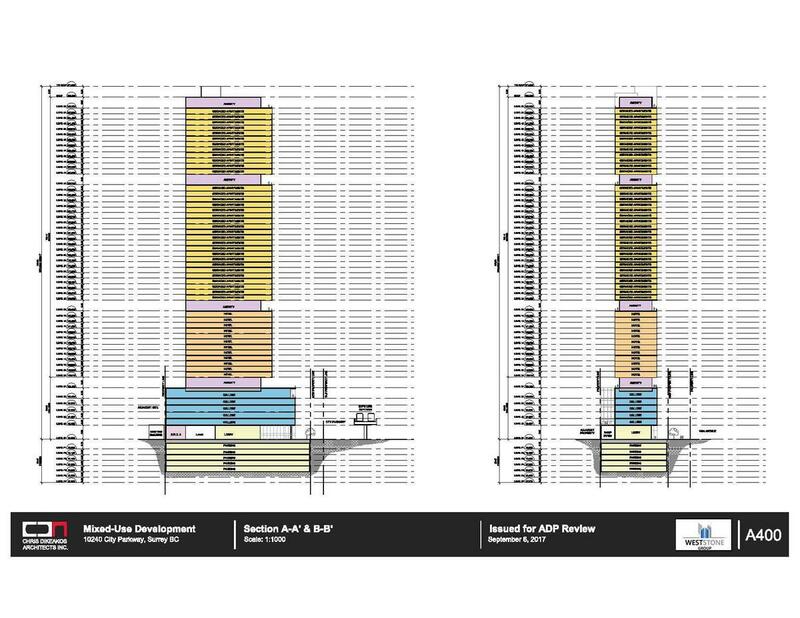 The proposed 55-storey tower, set to become Metro Vancouver’s 2nd tallest, will now proceed to Public Hearing for 3rd Reading (Preliminary Approval) on October 23rd. A 6-storey podium with 486 square metres (5,233 sq.ft.) 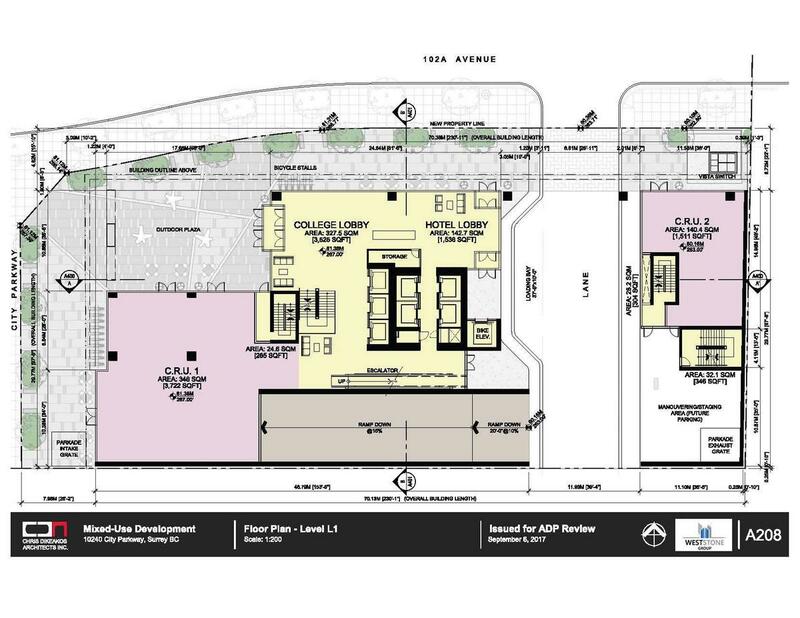 of ground-level commercial retail space, and 5 storeys of college/academic space, including classrooms and offices. As part of this application, a portion of 102A Avenue will be dedicated and constructed, along with widening along City Parkway. A new signalized intersection at City Parkway and 102A Avenue will also be delivered. Discounting the land to be dedicated for road, the proposed Education Centre has a net density of 18.25 FAR. The project is being developed under a partnership between Surrey-based developer WestStone Group, and Vancouver-based CIBT Education Group. CIBT Education Group is an education provider that targets primarily international students, and operates Sprott Shaw College, Sprott Shaw Language College, Vancouver International College and CIBT School of Business, amongst others. CIBT Education Group offers business and management programs and other vocational programs through these schools. Specifically, the Education Centre is intended to offer programs that will integrate with the services and functions proposed in the City’s Innovation Boulevard plans, including in the fields of medical assistance and facility operations. As part of the proposal, the project will dedicate approximately 7 metres for the widening of City Parkway, which will be required to accommodate the future LRT line and stop, as well as a new sidewalk and a separated bike lane. 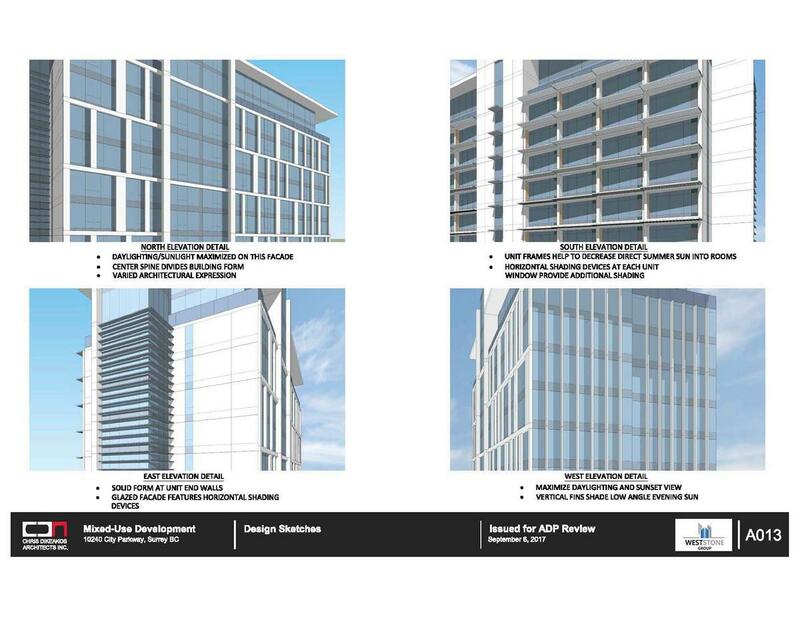 A new portion of 102A Avenue will also be constructed along the north property line, and a new lane will be constructed through the podium of the building running north-south towards the rear of the site. 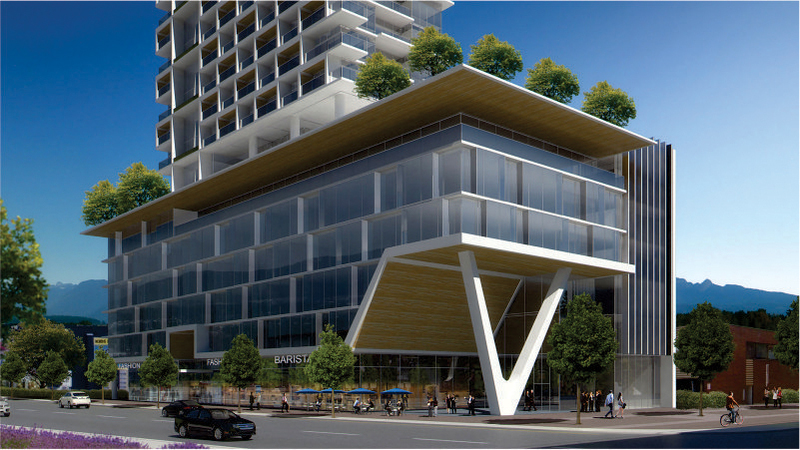 The project will feature an outdoor plaza at the northwest corner of the site, where the building is supported by a 4-storey fork column to create an open, bright, publicly accessible open space. In order to provide articulation in the tower, differentiation has been introduced at the amenity levels by setting the glass back and opening up the floor plate to provide outdoor amenity space. LED lighting will be provided to highlight the undersides of each amenity level in the tower. A Commercial Retail Unit (CRU) fronts City Parkway and wraps onto the outdoor plaza to bring additional activity into the space. The main lobby fronts 102A Avenue and also wraps onto the outdoor plaza. A second, smaller CRU fronts 102A Avenue. 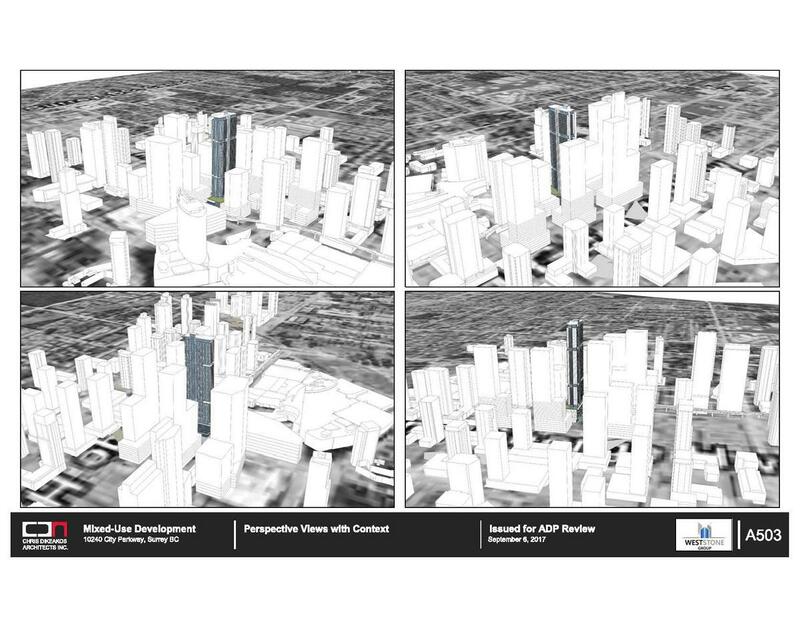 The podium and tower base will provide a strong urban edge and street wall along City Parkway and 102A Avenue. 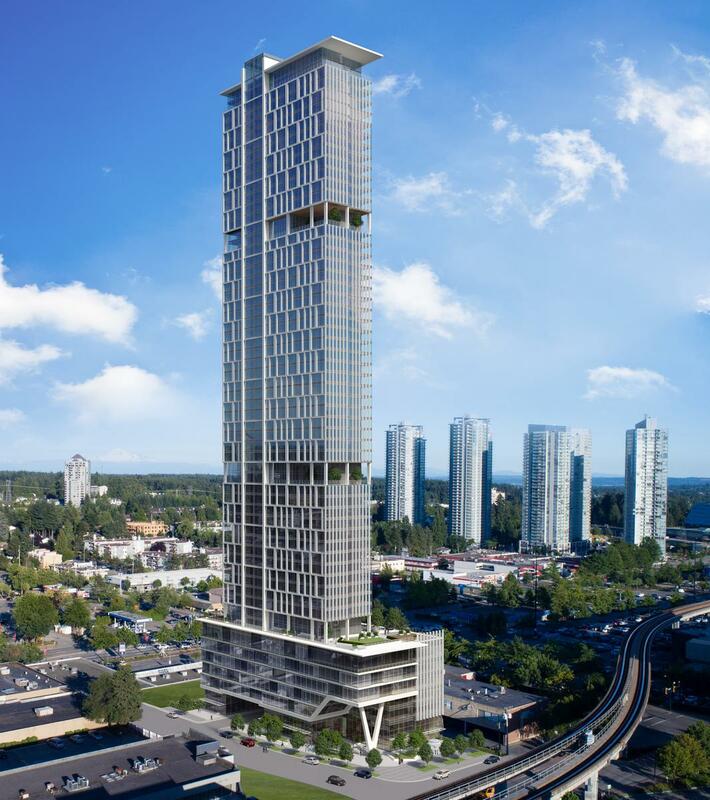 The City of Surrey’s Advisory Design Panel (ADP) has approved the design for the upcoming 55-storey Education Mega Centre, being developed by CIBT Education Group in partnership with Surrey-based WestStone Group. The height of the tower, which was previously quoted to be 50-storeys, has now been confirmed at 55-storeys, however, taking into account several double-height floors, will be the equivalent of 63-storeys reaching a total height of 625 feet. 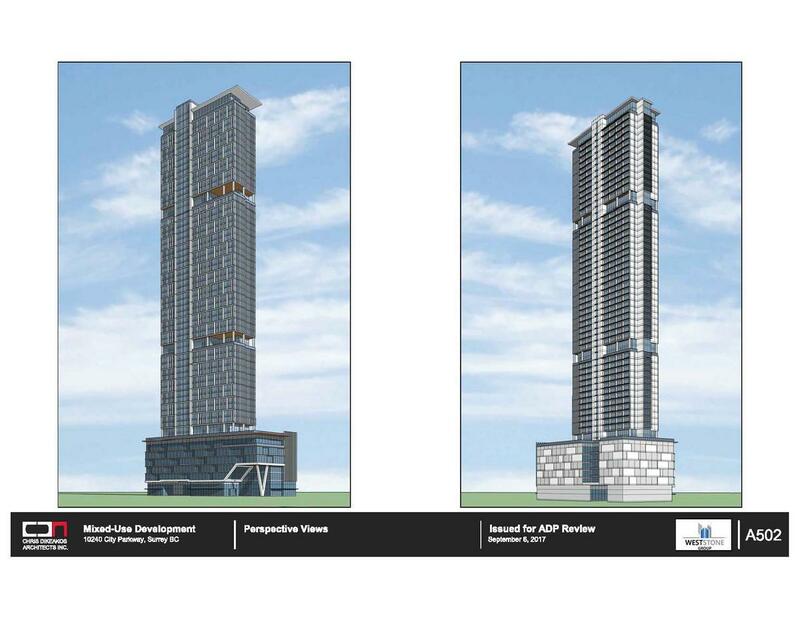 This would make the tower the tallest building in Surrey once complete, and the 2nd tallest tower in Metro Vancouver, after the Shangri-La, which is 645 Feet. The current 2nd tallest is the Trump Tower at 616 Feet. Supporting amenities including an electronic library, cafeteria, computer centre, study areas, quiet lounges, fitness centre, yoga room, laundry room, meeting and video conference rooms, office space and a coffee/tea lounge at the 55th floor 600 feet above ground. Now that the project has passed the design panel approval stage, it will move forward to Council for 1st & 2nd readings when Council returns from summer break on September 11. Further renderings and details of the project will be released at that time. The project is expected to break ground by early next year, and be complete by 2021. 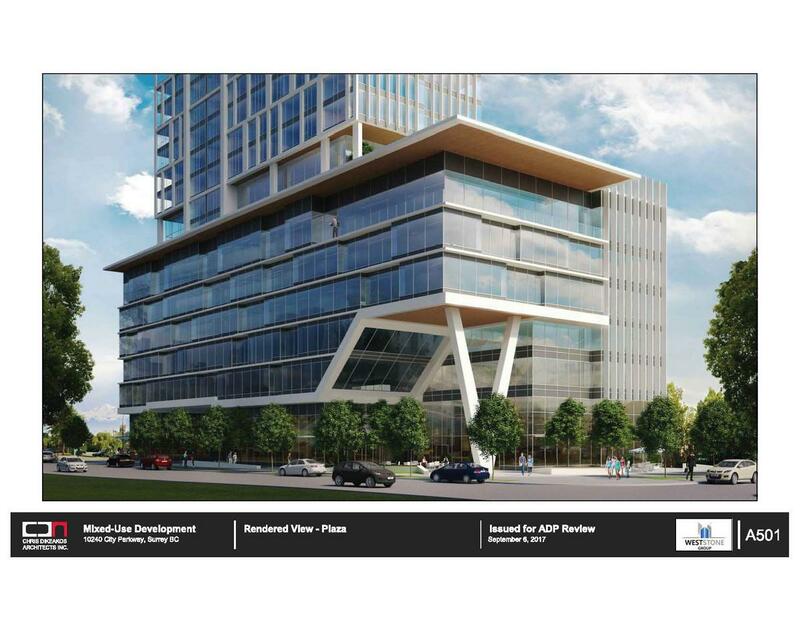 A development application has finally been submitted for a proposed 50-storey ‘Education Mega Centre’ first announced last fall by WestStone Group. The mixed-use building which is to consist of student housing, a college campus, commercial uses, and hotel, is set to replace the well-known Stardust roller skating rink that has been on the site since the 1970’s. The project is a partnership between the education and student-housing investment company CIBT Education Group and Surrey developer WestStone Group. CIBT already owns and operates a global network of business, technical, and language colleges throughout North America and Asia. 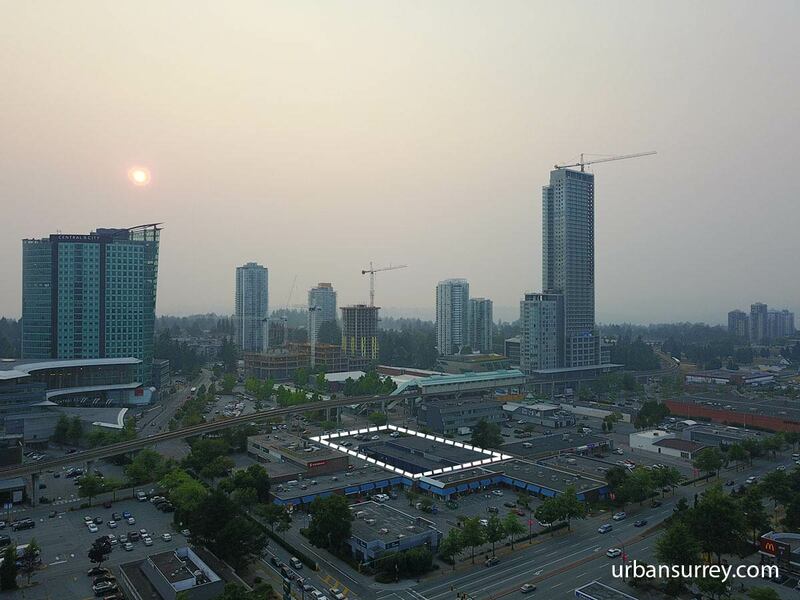 The Mega Centre will be located at the heart of Surrey city center immediately between Simon Fraser University and future location of Kwantlan Polytechnic University. With Surrey’s state of the art Civic Library and the iconic Surrey City Hall located within one block, along with Surrey Central SkyTrain station and the central bus loop located in front of the Mega Center and the upcoming Light Rail Transit (LRT) system on its doorstep, this is one of the most desirable and convenient locations for students and visitors. It is being proposed that the podium of the Mega Center (levels 1 to 2) will provide for many supporting amenities such as a food court, student lounge, computer centre, electronic library, conference rooms as well as office space for education consultants and other industry related services. Levels 3 to 6 will be leased to 20 educational institutions from around the world as their satellite campuses in Surrey. Levels 8 to 26 will be comprised of residential suites designed for long term stay international students. Levels 7 and 27 will be comprised of amenity space such as fitness centre and lounges for long term residents and student hotel guests. Upper floors from level 28 to 49 will be GEC’s flagship student hotel for short term stays. Level 50 will be the front desk and check in area for the student hotel. The Mega Center will consist of approximately 550,000 square feet and a development budget of $230 million.